The beauty of hydroponics lies in its flexibility. There is no right way to create a hydroponic system. Depending on the available space, plant species and other variables you can use any one of at least half a dozen systems. Of these, one of the most popular and commercially viable options is a drip system. What Is The Drip Irrigation System? 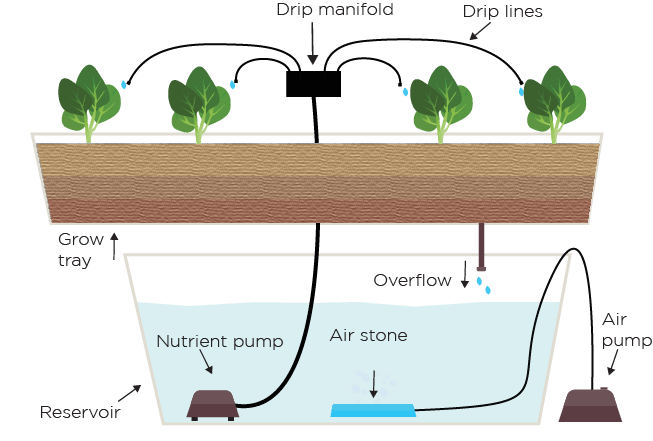 A drip system is an active hydroponic system. This means that it uses a pump to feed your plants with nutrients and water regularly. It is also called trickle, or micro irrigation system. As the name suggests, the system uses small emitters to drip the nutrient solution directly onto your plants. A drip system is not unique to hydroponics. Such a setup is also widely used in outdoor gardens to deliver water and nutrients to individual plants. It works equally well with soil as well as growing media. In fact, the drip system was initially conceived for outdoor cultivation of plants in Israel. The system was developed to improve water efficiency in the outdoor cultivation of crops. It was later successfully adapted to hydroponics. Instead of spraying or running water to the plants, the emitters secrete the liquid in a slow dripping action. This ensures that the system uses very less water. You have a high level of control over the amount of water and nutrients supplied to the plants. 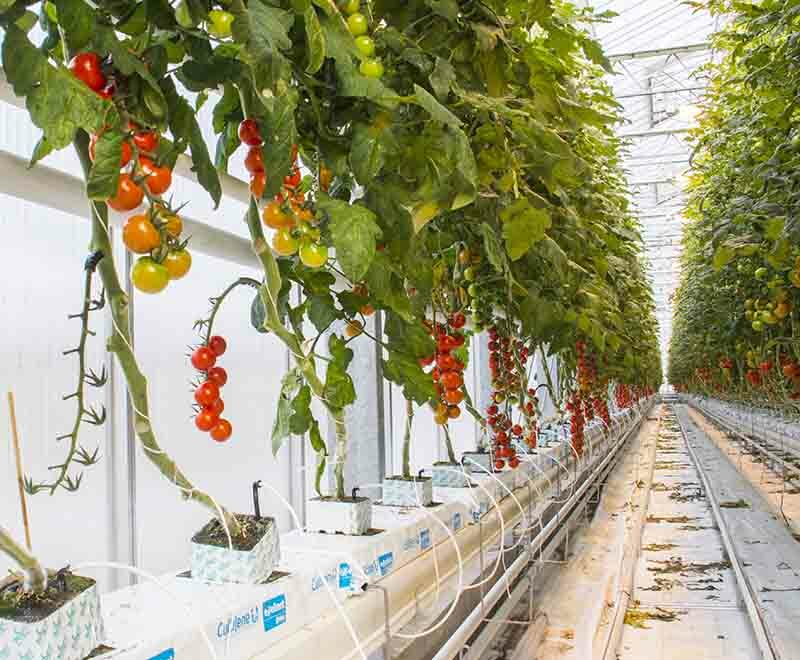 The system uses a network of feeder lines to deliver the water to the plants.This kind of setup is best suited for large growing operations. This is the reason for commercial operations preferring drip hydroponics over other systems. How Does The Drip System Work? The system usually uses individual pots for plants. The water from the reservoir is connected to the plants by a network of tubing. There are two ways to apply pressure to the water supply. It can be a regular water pump or a gravity-based system. Each individual plant gets at least one dedicated drip emitter. Each emitter has mechanisms that allow you to control the flow of water. This adds to the overall versatility of the system; you can set different flow levels for various plants. The flow to the plants has to be regulated in a drip system. The growing media needs to be given time to breathe in between flows. If left uncontrolled, a drip system will flood the plants and eventually drown them. So all drip systems use some kind of timer system to regulate the flow of water and nutrients to the plants. In typical situations, the pump is operated several times a day to send water to the plants. Such a system requires considerable planning and effort in the initial stage. But once the drip lines and carefully installed, the system can run with minimal assistance. These systems can be designed to have a high degree of automation. When the water is added to the hydroponic medium, all of it is not absorbed by the roots of the plant. In recovery systems, the excess water left behind in the medium is allowed to flow back to the reservoir. This kind of a system is very popular for smaller, home-based drip hydroponic setups. While it is more efficient in its use of water and nutrients, the system also has some drawbacks. When the wastewater is allowed to flow back to the reservoir, it affects the pH level of the reservoir water. This means you have to perform periodic maintenance on recovery systems. The reservoir water will have to checked to ensure that the optimum pH and nutrient levels are maintained. This is easier and more cost-effective in smaller drip systems. As the name suggests, in this system, any excess water is allowed to run off as waste. In usual circumstances, it is not very desirable to waste the water and nutrients like this. But since drip systems are highly conservative, the scale of wastage is relatively less. This kind of system is very popular in larger commercial drip hydroponic setups. Commercial growers have the ability to use sophisticated timers to have maximum control over the water flow. This can keep run-off to a minimum. There is another factor that makes such a system highly desirable for commercial growers. It requires lesser maintenance to the reservoir water. You don't have to worry about the recycled water altering the pH and nutrient levels in the reservoir water. Drip Emitters: Depending on the number of plants you plan to grow, you will have to buy an emitter for each plant. They are readily available at garden centers and hydroponic suppliers. Thin Tubing: spaghetti tubing is readily available in the market and is perfect for a drip emitter. PVC Tubing: These will be the main lines that carry the water and nutrients from the reservoir pump to the emitters. Depending on the size and complexity of your setup, the length and number of tubes required will vary. For smaller home-based setups, two-inch tubes are enough. Water Pump: a regular submersible pump is more than adequate for the task. Capacities of between 120-300 gallons per minute should suffice for smaller setups. A Tray: In smaller recirculating setups, you can get best results by having all the pots drain into a common tray. This is a simpler option than having separate run-off tubes from each pot to the reservoir. A Large Bucket/Bin: This will act as the reservoir. Choose between 10-20 gallon volume depending on the size of your setup. The basic setup is simple. Place the pump inside the reservoir, and connect it to the emitters using the PVC and spaghetti tubing. Place individual drip emitters into the growing medium in each pot. Don't forget to have adequate drainage holes in the pots. Incidentally, you can also get the system to work without drip emitters. You can just poke holes in the spaghetti tubing and apply that directly to the growing medium instead. But the emitters do provide additional control over the flow of water. Place the pots in the tray, and then place the setup in such a way that the run-off drains into the reservoir. Give it at least several inches of height advantage over the reservoir for gravity to have an effect. If the reservoir is in a higher location, you will need a pump to get the water back in. Attach the timer to the pump power source, and set it to run on a daily schedule, like for 5 minutes thrice a day or something similar. It can vary depending on the water requirements of the plant. Since it gives you better control over the water and nutrient inputs, a drip system is ideal for a wide range of plants and herbs. It works well with different growing media as well, so this also increases the scope of this system. Drip systems are considered especially suited for larger plants. These plants require larger growing media, which can retain larger amounts of moisture for a more extended period. So, despite the slow watering system, the larger plants get proper hydration and nutrition in a drip setup. For best results, a slow draining medium is preferred. The most popular options in this category include Rockwool, peat moss, or coconut coir. Other media like clay pellets, perlite, and gravel can also be used successfully. So there you have it. 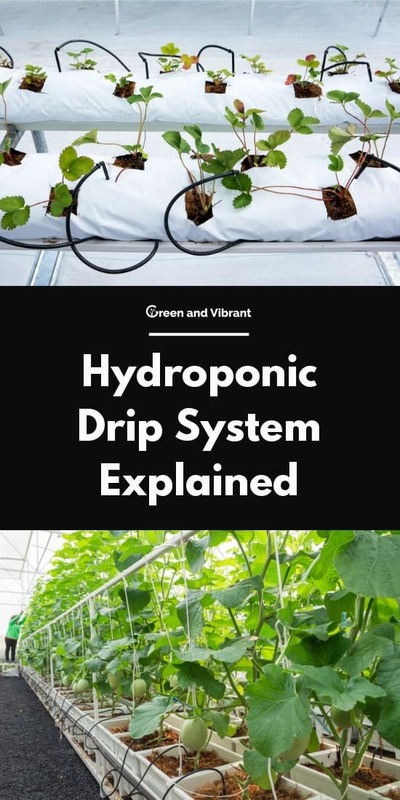 A drip system is a very versatile and practical way to do hydroponics. It is suitable for a wide range of plants and herbs and offers you superior control over water and nutrient supply. And once rigged up correctly, the system basically runs on its own with minimal oversight. Hope found this article informative and useful. Feel free to share any questions or queries you may have regarding hydroponics in the comments below. And if you have any experience with drip systems, we would love to hear from you. Thanks for visiting our site. And happy growing!